I actually think of it the other way, Pat. I think of the babies being flighty and by the time they are yearlings they are much more deliberate in their movements. Mine mostly hide during the day unless I get them out. They seem to be most active from dusk to midnight in my experience. That's when I've always caught them out and about on their own at any age, though both my corn snake girls will sit in their hides with their head in the door during the day. You are welcome, Pat! Zuzee's behavior is very typical for a newly moved snake. It does take them a week or two to get used to new quarters including different lighting and sound. Snakes are sensitive creatures. Pat, once they are used to being handled you can get them out whenever you like except if they are digesting or in shed. If you want to visit with George, by all means just get him out. At a year, unless he seems to be stressing for some reason, you can easily have him out for an hour with no ill effect. P.S. Supervised of course. 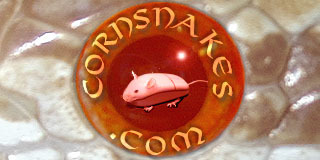 Never leave you eyes off of a corn snake unless it is secure in its enclosure or other snake proof container. You are doing fine, glasses or not!